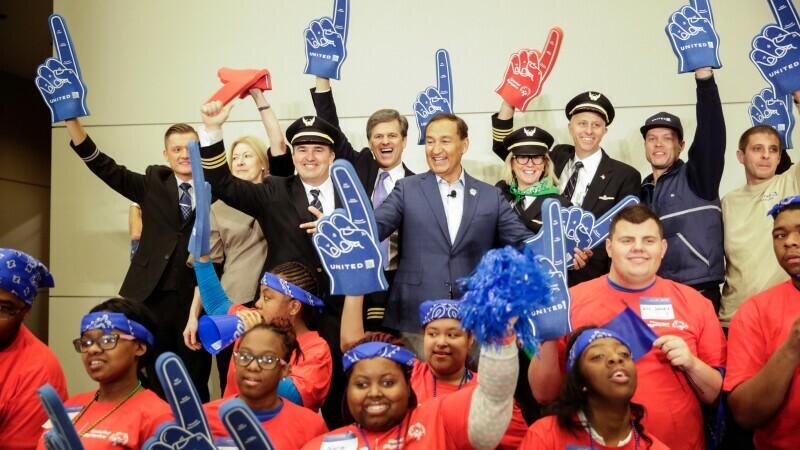 United Airlines and Special Olympics International today announced the expansion of their relationship globally, celebrating in their shared vision to end discrimination against people with intellectual disabilities. The announcement is the next evolution in United’s relationship with Special Olympics that represents a continued effort to break down barriers and further build on the organization’s remarkable legacy of inclusion by engaging the airline’s employees around the world. As part of the relationship, United will implement new employee training scenarios to make traveling a positive experience for individuals with intellectual disabilities. By the end of 2018, more than 60,000 United frontline employees will participate in new training modules that reflect Special Olympics’ insights as the airline takes steps to lead in inclusion. Through this commitment, United will also support Special Olympics 50th Anniversary celebrations in Chicago and the 2018 Special Olympics USA Games in Seattle. In other parts of the US, United will be represented at Special Olympics events where customers and employees live and work including San Francisco, Los Angeles, Denver, Houston, Chicago, Virginia, New York and New Jersey. United Airlines and United Express operate approximately 4,500 flights a day to 338 airports across five continents. In 2017, United and United Express operated more than 1.6 million flights carrying more than 147 million customers. United is proud to have the world's most comprehensive route network, including U.S. mainland hubs in Chicago, Denver, Houston, Los Angeles, New York/Newark, San Francisco and Washington, D.C. United operates 743 mainline aircraft and the airline's United Express carriers operate 478 regional aircraft. The airline is a founding member of Star Alliance, which provides service to 192 countries via 28 member airlines. For more information, visit united.com, follow @United on Twitter or connect on Facebook. The common stock of United's parent, United Continental Holdings, Inc., is traded on the NYSE under the symbol "UAL".